At the Massachusetts Conference for Women on Wednesday, so-called "feminist icon" and late-1990s Bill Clinton apologist and enabler Gloria Steinem made a big deal out the fact that she never has and never will call Donald Trump "president" — to her, he's the "harasser in chief" — while claiming that Trump "lost" last year's general election by "10 million votes." The vast majority of the establishment press is ignoring Steinem's virtually illiterate remark. In one noteworthy instance, the Associated Press either ignored the obviously noteworthy "10 million votes" claim or deleted it in a subsequent revision to an earlier report. Steinem's "10 million votes" remark has been reported at Bustle.com and New England Cable News, and has been sharply criticized by Matt Vespa at Townhall.com on Saturday. That's it. 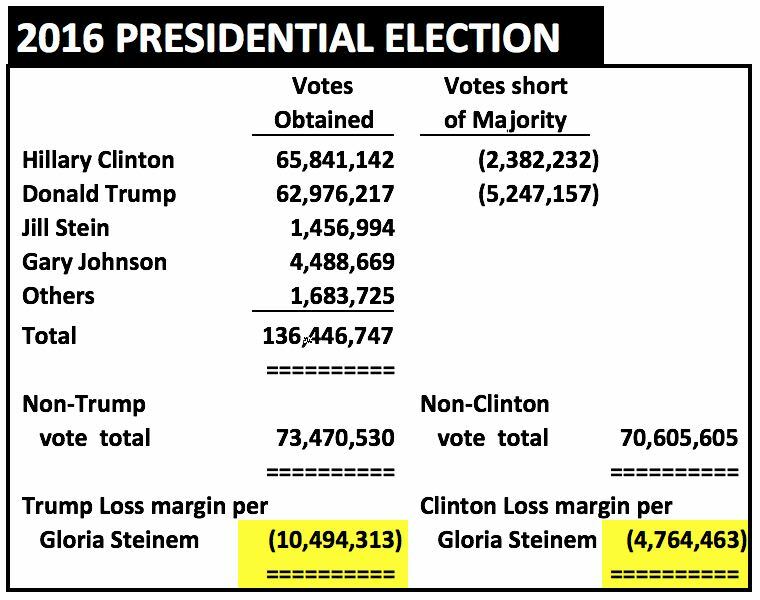 Steinem's illogical nonsense demands that a presidential candidate must achieve a popular-vote majority to "win," because her definition of the margin of defeat compares a candidate's votes to all other votes. Likewise, Bill Clinton, who failed to achieve a popular-vote majority in either of his presidential election runs, "lost" by Steinem's illogic in 1992 and 1996 by 13.7 million and 1.5 million votes, respectively. Someone should send Ms. Steinem one of those "Math Class Is Tough" Barbie dolls which appeared briefly in the early-1990s. As to the Electoral College having its basis in slavery, suffice it to say that Steinem is as bad at history as she is at math. 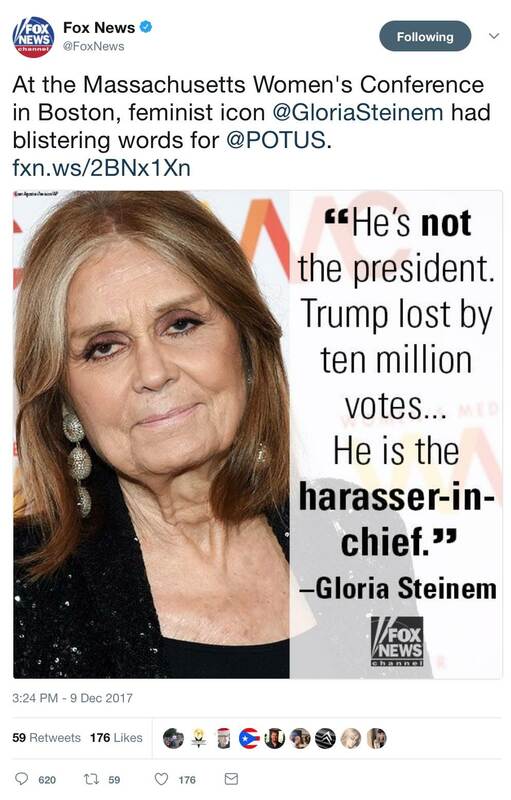 There's only one problem: The link at Fox's tweet, which goes to an Associated Press article at Fox's website, currently has no reference to Steinem's "10 million votes" statement. That same unbylined AP item is at dozens of other news sites, none of which contain any reference to that statement. The story is primarily about actress Meryl Streep's Thursday statements at the conference, and only refers to Steinem in a single sentence in the second-to-last paragraph. The AP appears to have intended that its subscribers replace a Wednesday item on Steinem's appearance with the Thursday item currently seen at Fox. When a user searches Google News and clicks on many of the items containing Wednesday's headlines (either "Gloria Steinem calls President Trump 'harasser in chief'" or "Steinem takes shot at President Trump at women's conference"), he or she gets taken instead to the same Thursday story seen at Fox. That Wednesday AP item is still at a few websites. Though it also has no current reference to Steinem's "10 million votes" statement, it may have had one in an earlier version. We'll probably never know, because, as I noted several weeks ago, the AP has become far less transparent, and "better" at flushing old or revised stories down the memory hole. Regardless of whether the AP ever reported Steinem's "10 million votes" claim, the fact remains that it is not reporting it now. A prominent conservative or Republican women making a similarly stupid and ignorant claim would not get the pass Steinem is receiving, but would instead be mercilessly and prominently ridiculed.